More saving, more doing. And, now, more hacking fears, this time at your neighborhood Home Depot. The world’s largest home improvement retailer is scrambling this morning to make heads or tails of a possible credit and debit card data breach. The news of a potential cyber attack on its payment systems first surfaced yesterday afternoon. The Atlanta-based company said in a statement to customers today that it still isn’t sure if a breach actually occurred or not. However, if its payment systems were actually compromised, Home Depot says its customers won’t be liable for potentially bogus charges. 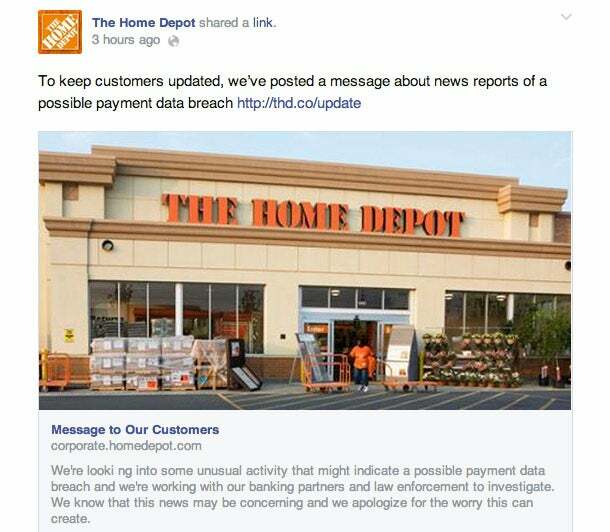 Updates on the situation were also released via Home Depot’s Twitter and Facebook accounts. Home Depot, which has 2,200 retail stores in the U.S., Canada and Mexico, assures customers that they will be notified immediately if a breach is confirmed. In the meantime, it advises customers to closely monitor their payment card accounts for unusual activity. As with the recent UPS Store breach, credit monitoring will be offered to potentially impacted customers. For those who have questions, Home Depot asks that you call its Customer Care line at 1-800-HOMEDEPOT. The company has not yet responded to Entrepreneur.com’s request for comment. Home Depot could be the latest victim in a string of sophisticated payment system hacks targeting major retail chains. Major stores recently hacked include UPS Store, Target, Neiman Marcus, Michaels, Goodwill, Albertson’s and SuperValu.